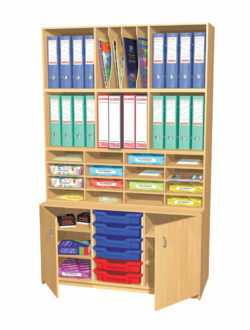 That’s something that some of us find difficult to achieve…… but these Ultimate units can make storage and organisation easier and hopefully more effective in your offices and classrooms. These units are delivered to your organisation fully assembled (not flat packed) and are manufactured in the UK. One particularly useful feature is that although they provide so much storage and filing capacity they are only 456 mm deep, so they don’t take up much floor space. In this respect they are probably the most effective, easily accessible means of storage and filing available.